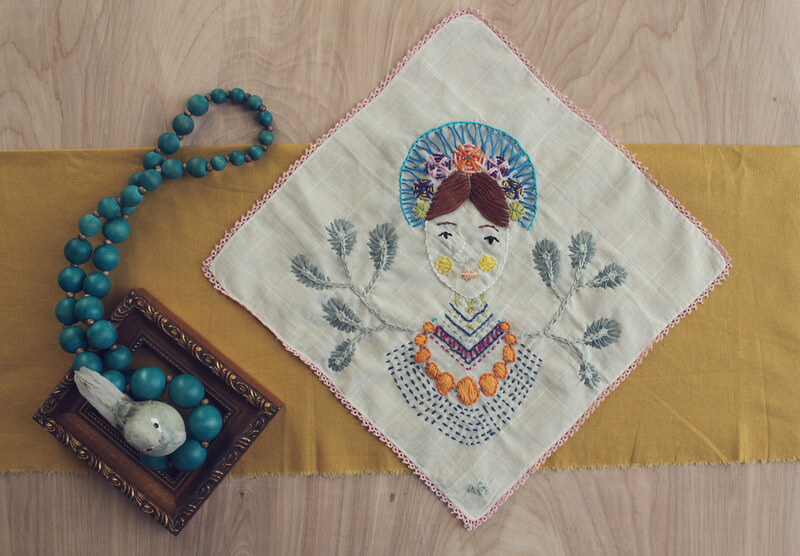 Sampler is a love letter to contemporary, hand-crafted embroidery on vintage fabrics. 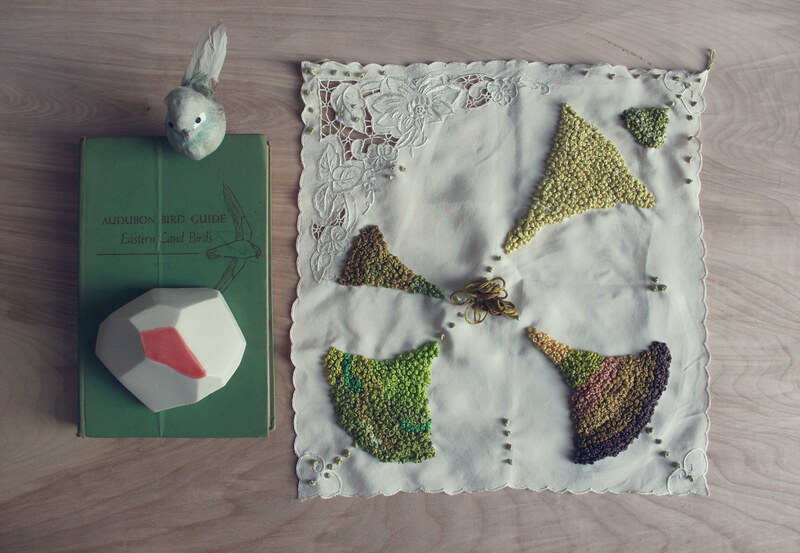 Sampler is a love letter to contemporary embroidery on vintage fabrics. Brought to you by Brown Paper Bag.© 2013. 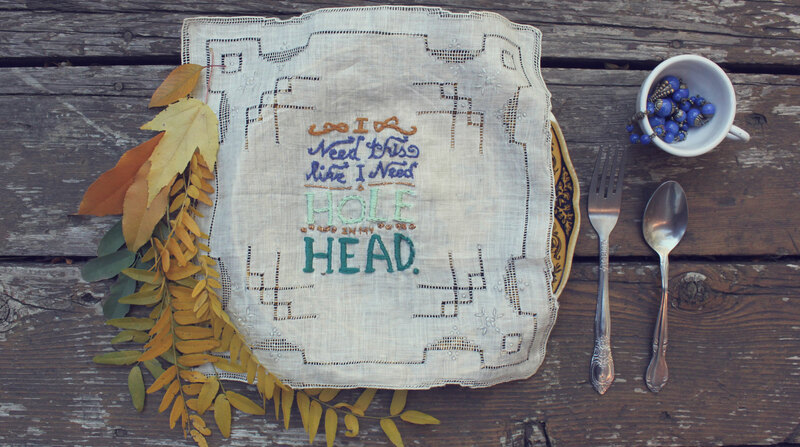 Sampler is an embroidery project. It's more than just that, though. It's also a mail art project, and repurposes vintage items. The project features 5 talented artists and illustrators from around the world: Sarajo Frieden, Lorena Marañón, Perrin, Laura McKellar, and Amy Blackwell. Each participant was sent a vintage handkerchief. They were instructed to embroidery and adorn it however they like and mail it back to Sara, the project creator and organizer. The results are now available for all to see. They can be purchased here. Sampler was organized by Sara Barnes. She is the creator of the daily visual arts blog Brown Paper Bag. Follow her Twitter to find out other projects she organizes and how you can get involved. Growing up in an creative environment Laura quickly developed her photography and sewing skills which was nurtured by her artistic family. She began collecting old film cameras, second hand picture books and dress pattern illustrations from a very young age. Inspired by the desaturated colours, detailed drawings and dreamy landscapes within her vast collection of photos and illustrations, this collection helped to form the basis of Laura's aesthetic style. During her graphic design studies, Laura's technology skills advanced and she began to integrate digital art with her mixed media style pieces. She enjoys the experience of working hands-on and digitally. These pieces start on the computer by creating collages from collected images, then digitally printed onto textiles and finished with embroidery. These intricately detailed pieces align with Laura's values of creating beautiful hand crafted work. Born in Oakland, CA, Sarajo Frieden is a painter whose work is influenced by the diverse communities of the California Pacific Rim where she grew up. She has a BFA from UCLA and lives and works in Los Angeles. Frieden has participated in exhibitions both nationally and internationally, including in Los Angeles, New York, Melbourne and Rome. Her travels to Asia, North Africa, Australia, Central and South America, provide inspiration for her work which references, among other things, the art of world cultures. For the past twenty years, she has worked as both a graphic designer and illustrator, and her award-winning designs have appeared on CD's, packaging, film titles, in illustrated books, textiles and more. She currently divides her time between her artwork and illustration commissions for a variety of clients. In September, 2013, she was a fellow at the Vermont Studio Center. 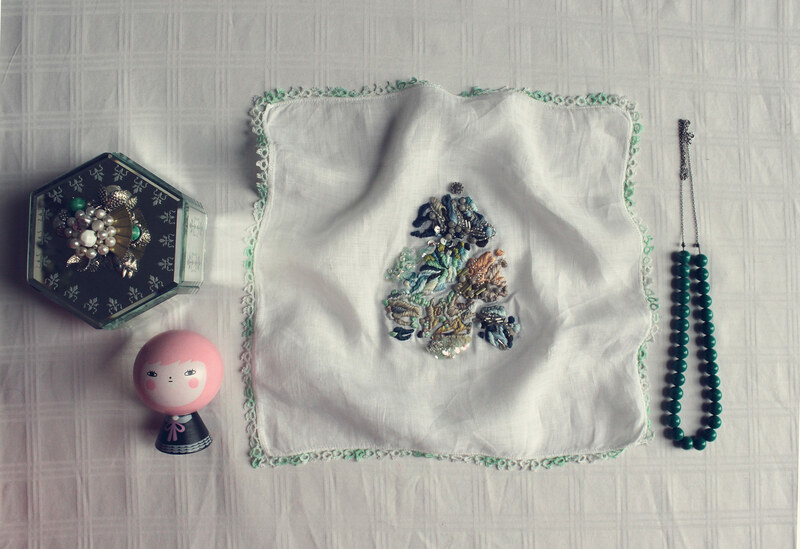 Lorena Marañón is a 25 year old textile artist living and working in Miami, FL. She began embroidering in 2009, producing small and experimental pieces that became the foundation of a four year long jewelry business. Since then, her work has shifted from mass production to a personal and abstract form of expression. 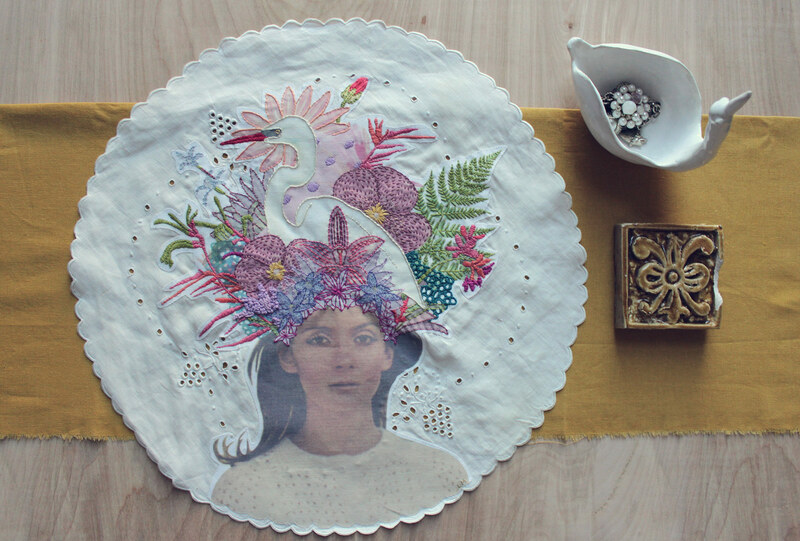 Very often, symmetry becomes a focal point in her embroidered images. Inspiration and references come from microscopic studies or textbook illustrations of organisms as well as her love of hard shapes and color (in particular those she associates with her Afro-Cuban background). Continuing to watch herself evolving alongside embroidery has become the sole intention of all her new pieces. Perrin is an illustrator, designer, collaborator, entrepreneur, and educator currently based in Baltimore, Maryland. Her work has been recognized by 3X3 Magazine, Print Magazine, and the Illustrator's Club. Amy Blackwell is a crafty maker based in Nottingham. She is one half of the brand new creative duo known as Audrey and Illya. She loves to knit, paint, print, doodle, scribble, eat breakfast for dinner, crochet… the list goes on. Amy graduated in 2007 and launched her own digital illustration business shortly afterwards. Hankerchief by Laura McKellar. Available for purchase now. Hankerchief by Lorena Marañón. Available for purchase now. Hankerchief by Sarajo Frieden. Available for purchase now. Hankerchief by Perrin. Available for purchase now. Hankerchief by Amy Blackwell. Available for purchase now.